We aim to offer our customers are vast array of mirrors ranging in many different styles. From traditional to art deco and contemporary. All glass mirrors and framed mirrors are all available. Some mirrors feature concave glass in which the glass bends inwards, resembling the interior of a bowl, producing reflections which appear larger than they really are. Conversely, convex mirrors feature glass which bends outwards creating objects which appears smaller when reflected. Most mirrors feature plane glass, reflecting lights rays in the same order in which they are received, reflections are as in reality, an accurate reflection of the image in front of them. Alongside the large range of mirrors available to us we can also create completely custom framed mirrors, specific to your design needs, with accuracy of size down to the millimetre. It’s important when choosing a mirror, or any piece of art work for that matter, to know first and foremost, where you intend to use it. What is the size of the wall on which you wish to display it? What are the colours and tones are already at play in the room? What is the purpose of the mirror? Is it an understated piece designed to bring the décor together? Or is it a grand statement piece? 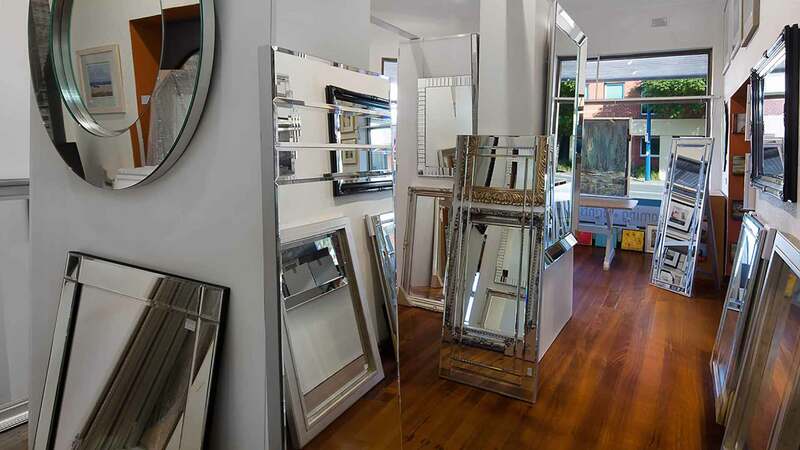 So, whether you’re looking for a mirror for a bathroom, a bedroom, a lounge room or a boardroom, let us work with you to find the perfect mirror to match your needs and desires.